Travel has a positive impact on so many aspects of our lives: from the memories it helps us create with family and friends, to the trillions in economic output travel delivers and the millions of American jobs it supports. So, for this year’s National Travel and Tourism Week (May 5-11), we are spotlighting a different example each day of why travel matters to America. Use Sunday, May 5 to celebrate how travel matters to the economy. Each year, traveler spending in the U.S. generates more than $2 trillion in economic output—boosting local communities across the country, all while helping reduce America’s overall trade deficit. Though many people don’t immediately think of travel as an export, it is America’s second-largest industry export. Every time an international visitor comes to the U.S. and stays in a hotel, rides a train, eats in a restaurant or makes a purchase in a store, the U.S. is “exporting” these goods and services. In 2017, Americans abroad spent $174 billion, while international visitors to the U.S. spent $251 billion—resulting in a travel trade surplus of $77 billion that helps lower our overall trade deficit. 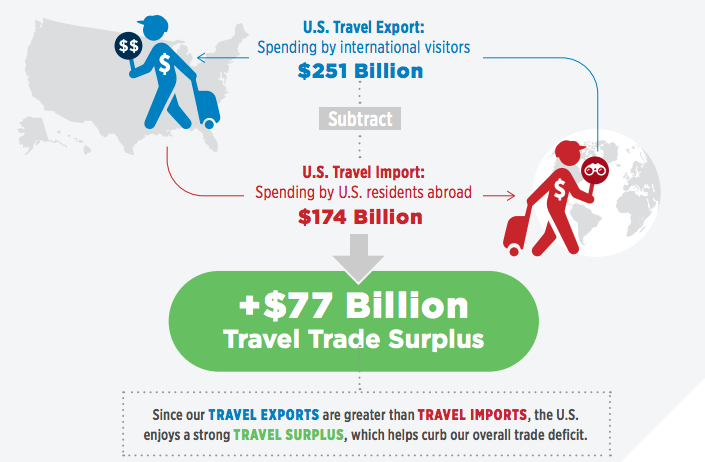 Without the surplus provided by travel, the overall U.S. trade deficit would have ballooned 14 percent from $552 billion to $630 billion. Write an op-ed about how travel contributes to your community. Reference U.S. Travel’s resources for statistics, below, and incorporate your own economic impact and jobs data to localize the content. Pitch it to local media or distribute through a newsletter or on your CEO’s LinkedIn page. Use the Economic Impact Map to show how vital travel is to your district’s economy and workforce. National Travel and Tourism Week is our industry’s time to celebrate the innumerable ways in which travel strengthens communities and enriches lives. Interested in other ways you can celebrate why “Travel Matters” during NTTW? View the full theme calendar. Don’t forget to include #nttw19 or #TravelMatters in your posts for a chance to be featured on our social channels and included in our wrap video. Planning an event? Add it to the official NTTW event map. Visit the NTTW toolkit for more resources to get involved.